One of the more unpleasant effects of the referendum result has been a spike in anti-immigrant activity, with abuse hurled at Poles in the street and graffiti daubed on cultural centres run for and by EU migrants. This change in atmosphere, allied to the uncertainty of their future status in a UK divorced from the EU, has led to understandable anxiety among immigrants from other EU countries. In this guest blog, taken from his Free Movement blog, Colin Yeo sets out the legal consequences of last week’s momentous decision. Colin recently took part in our panel discussion on ‘The Ethics of People Smuggling’, one of the activities run as part of our recent Call Me By My Name exhibition in Shoreditch, London. The people of what is currently the United Kingdom have voted to leave the European Union. What happens now? Here I am going to take a quick look at the immediate consequences for EU nationals living in the UK. In short, there are no immediate legal consequences that flow directly from the referendum result. The law of the United Kingdom only changes when Parliament enacts a new law through the full Parliamentary process and no such law has been passed. David Cameron, who is stepping down as Prime Minister, has stated that he will not immediately trigger Article 50 of the Treaty on European Union, so there will be no immediate change to free movement laws either. The longer answer is that we just do not know what will happen in the weeks and months ahead. Even before the referendum on 23 June some advertisements – such as this deliberately provocative ad put out by Operation Black Vote – were being criticised for focusing on immigration in a way that was bound to incite animosity. The Immigration Law Practioners Association put together a series of briefings on different Brexit issues which may be of interest. These are largely speculative, though: no one knows what is going to happen now. If the new Prime Minister does trigger Article 50, then the UK will leave the EU within a two-year period and will at the point of leaving cease to be subject to EU law, including free movement law. There is some optimistic talk of Article 50 not being triggered and instead a further renegotiation taking place, and perhaps another referendum. That seems politically very unlikely, and it is hard to see how internal Conservative Party politics would allow for such an eventuality. With the pound plummeting, UK government debts to be downgraded, Scotland to demand a further referendum and perhaps with an exodus of big employers to be announced, I guess the politics may change as people realise what they have done to themselves and their country. But I seriously doubt it. It is done. It seems certain that some generous provision will be made for EU nationals currently resident in the UK. There was some talk during the campaign of EU nationals automatically retaining “acquired rights” under the Vienna Convention of 1969. That sounds like legal nonsense to me and Professor Steve Peers seems to think so too. Some specific legal provision will need to be made under UK law in my view. If the Government has any decency and any sense, an announcement on this will be made very quickly. In the week following the referendum, there had been a five-fold increase in the number of hate crime incidents reported to the National Police Chiefs Council (as of Thursday 30 June). It seems certain that some generous provision will be made for EU nationals currently resident in the UK. There are around 3 million EU nationals living here, all of whom would need a new immigration status. Many of them do not have residence documents because under EU law residence documents are optional for EU nationals and their family members. My best guess is that free movement laws would be incorporated into UK law. At the very least this would apply to those who are already resident in the UK as at a certain date. The law would take effect automatically without anyone having to make an application as such. On a sliding scale of ever worse possibilities, the existing rules might be tweaked to make it harder to qualify for settlement and easier to deport, family members of EU nationals might not be treated as generously as EU nationals themselves or, worst case, all 3 million EU nationals would suddenly be required to make new applications under UK immigration laws. This last possibility seems extremely unlikely. The UK may end up staying in the European Economic Area, like Norway, in which case free movement laws would continue to apply as they do today, including for future residents from the EU. However, given that immigration seemed to be the decisive issue in the referendum — much to our collective shame — joining the EEA seems like the worse of all options, as it would mean continued free movement rules but also continued payments into the EU and no control over the rules to which the UK was signed up. 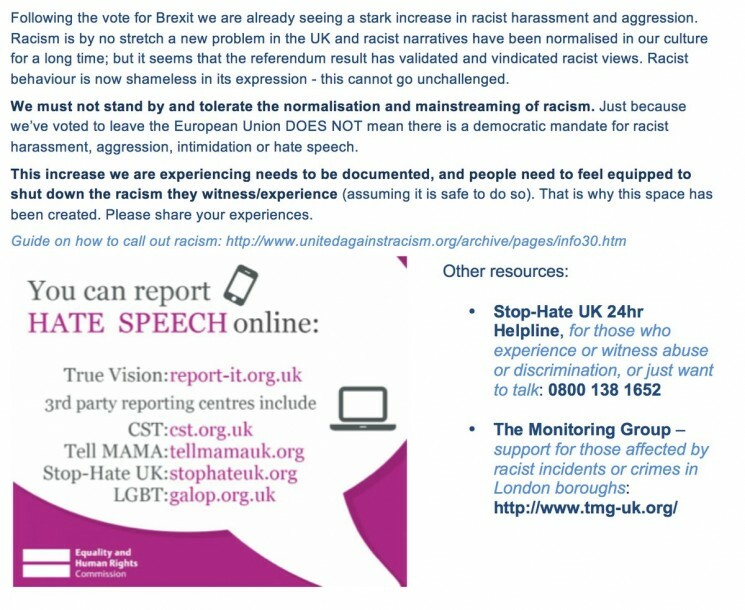 There is widespread concern that the referendum result appears to have legitimised racist activity. In the meantime, many EU national residents will be extremely concerned about their position. 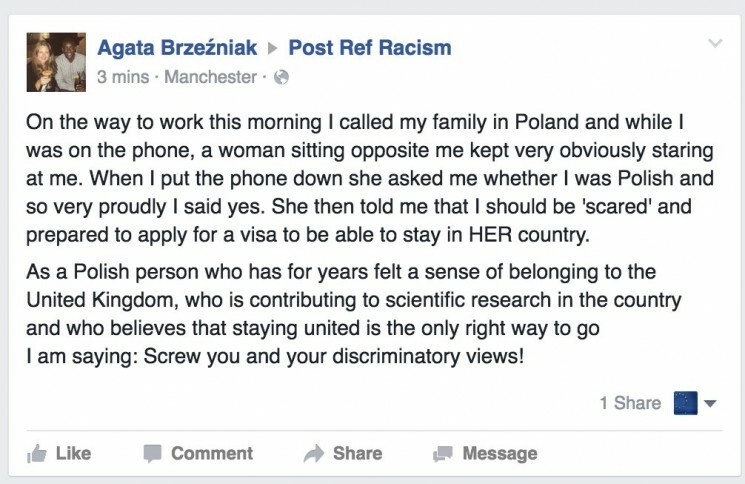 Family members of EU nationals may be even more concerned. Many will want to apply for residence documents, for permanent residence and for naturalisation as British. I’ve previously written blog posts which may be helpful (all of those below are up to date) and also put together an ebook guide on making EU free movement applications. On a personal level, let me end this piece by saying how sorry I am to any EU national readers. I am sorry that our country has put you in this position. The vote is an awful, terrible result not just for the UK but for Europe and I am so desperately sad at the outcome and what it says about us. Colin Yeo is a barrister specialising in immigration at Garden Court Chambers who recently took part in our panel discussion on ‘The Ethics of People Smuggling’. This blog was first posted on his Free Movement blog, the widely respected blog on immigration law.